Please use the form below to request a quote / estimate. 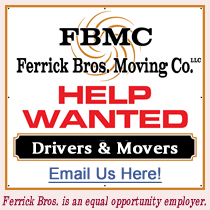 A Ferrick Bros. Moving Company representative will contact you shortly. If you need to contact us sooner, please call us at 1-978-225-0158. Note: Online estimates are not as accurate as getting a quote from the owner, Bob Ferrick, either on the telephone or a free, in-house estimate. Any additional comments, information or questions to help us serve you better? Note: You will receive a copy of your Quote / Estimate Form via the e-mail address entered above.